Born a colonist in the British Empire, Elizabeth Furse became an anti–apartheid activist, an advocate for migrant farm workers and Native Americans, and founder of a peace institute. She claimed her first elective office in 1992, representing a U.S. House district that encompassed suburban Portland, Oregon. Through a series of legislative initiatives, Representative Furse sought to turn the national dialogue away from its old Cold War focus to domestic reforms. Elizabeth Furse was born a British subject in Nairobi, Kenya, on October 13, 1936. Her grandmother, Dame Katherine Furse, established the Women’s Royal Naval Service (the “Wrens”) during World War I. Her father was a naval lieutenant who later settled in the then–British colony of Kenya as a coffee planter. The family moved to South Africa, where Furse’s mother established an anti–apartheid women’s group, “Black Sash.” Elizabeth Furse marched with the group at the age of 15. In 1955, she left South Africa to live in London, where she met and married an American doctor. They moved to Los Angeles, and Furse became a naturalized U.S. citizen in 1972. The couple raised two children, Amanda and John, though they eventually divorced. Furse later married John Platt. In 1974, Furse earned a B.A. at Evergreen State College, in Olympia, Washington. In California, Furse had been active in the United Farm Workers movement led by Cesar Chavez. When she relocated to Oregon in 1978, she worked as the director of the Oregon Legal Services Restoration Program for Native American tribes from 1980 to 1986. In 1985, Furse founded the Oregon Peace Institute for nonviolent conflict resolution. With her husband, she also became the owner and operator of a vineyard. Furse supported the Clinton budget in 1993 and the 1994 crime bill but opposed the North American Free Trade Agreement, citing its danger to small businesses in her district. She also secured funding for Portland’s Westside Light Rail Project. 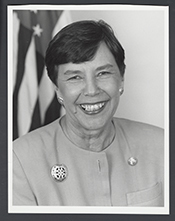 During her first term, Furse introduced an amendment requiring European allies to pay for a large portion of the bill for American troops stationed on the continent.3 She also supported one of Bill Clinton’s lightning rod campaign issues: the recognition and further incorporation of gays and lesbians into the military. In 1994, Furse won a razor–thin re–election campaign against Republican Bill Witt, beating him by 301 votes out of more than a quarter–million votes cast. She raised $1.1 million in campaign funds—more than twice Witt’s total—but nearly succumbed to Witt’s strong organizational base and an electorate that widely supported the Republican “Contract with America.” In 1996, she again faced Witt but won by a more comfortable margin of 52 to 45 percent.7 She surprised political observers in 1995 by entering the Democratic primary for the seat of resigned Oregon Senator Bob Packwood, of whom Furse had been highly critical after charges of sexual harassment were made public by some of his former aides. The nomination eventually went to U.S. Representative Ron Wyden. 1“Election Statistics, 1920 to Present,” http://history.house.gov/Institution/Election-Statistics/Election-Statistics/. 2Kevin Merida, “Role of House Women’s Caucus Changes,” 15 February 1995, Washington Post: A4. 3Almanac of American Politics, 1996 (Washington, D.C.: National Journal Inc., 1995): 1111–1113. 4Martin Fletcher, “A Daughter of the Empire Takes Arms Against Britain,” 27 November 1993, London Times. 5Congressional Record, House, 103rd Cong., 1st sess. (11 May 1993): 2351. 6Joel Connelly, “Battles for Women in the House,” 9 June 1994, Seattle Post–Intelligencer: A1; James C. Dao, “Senate Panel Votes To Lift Ban On Small Nuclear Arms,” 10 May 2003, New York Times: 2. 7“Election Statistics, 1920 to Present,” http://history.house.gov/Institution/Election-Statistics/Election-Statistics/. 8Interview with Furse and other women Members of Congress published in Redbook, September 1996. 9Congressional Record, House, 103rd Cong., 1st sess. (14 September 1993): 6681. 10Congressional Record, House, 105th Cong., 1st sess. (21 May 1997): 3148. 11Congressional Record, House, 103rd Cong., 1st sess. (28 April 1993): 2109. 12Congressional Record, House, 105th Cong., 1st sess. (14 May 1997): 2657. 13Marie McCarren, “The Expert and the Activist: When Amanda Briggs Wants to Tell Congress a Thing or Two About Diabetes, She Simply Calls Her Mom,” December 1995, Diabetes Forecast 48 (No. 12): 14. 14Bob Terry, "Washington County District 4 Race: Bob Terry Wins Over Elizabeth Furse," 21 May 2014, The Oregonian, http://www.oregonlive.com/washingtoncounty/index.ssf/2014/05/washington_county_district_4_r_2.html (accessed 31 August 2015). "Elizabeth Furse" in Women in Congress, 1917-2006. Prepared under the direction of the Committee on House Administration by the Office of History & Preservation, U. S. House of Representatives. Washington: Government Printing Office, 2006.